Pomegranates are fruit that are slightly larger in size compared to oranges. The outer skin is tough in texture while the inside contains sweet red gelatinous flesh and an abundance of juicy seeds. Pomegranate seeds or fresh juice is delicious, refreshing, and highly nutritious. This fruit can be eaten at any time during the day, either as part of a meal or a healthy snack. Here are 10 more reasons you should include pomegranates in your diet. 1. Boost immunity. Pomegranates are rich in anti-inflammatory compounds, making them extremely beneficial for those suffering from immune-related disorders like rheumatoid arthritis and osteroarthrits. They are also rich in vitamin C, which boosts antibody production and development of immunity. 2. Help digestion. To keep your digestive system healthy, you need to include fibre-rich sources in your diet. One pomegranate can fulfil about 45% of your daily recommended intake of fibre, which is about 20 to 35g. 3. Lower blood pressure. Pomegranates contain punicalagins which can help prevent dangerous muscle cell growth in blood vessel walls. 4. Prevent heart disease. Pomegranates are loaded with polyphenols that have powerful antioxidant properties. Antioxidants prevent free radical damage of the walls of arteries, thus preventing heart disease. They also prevent oxidation of cholesterol, which causes plaque formation and development of coronary artery disease. 5. May help prevent and treat several forms of cancer. This fruit contains polyphenol antioxidants in them which have been shows to inhibit the growth of tumor cells and induce natural death in them. 6. Anti-Allergic. The polyphenols contained in pomegranates have been shown to reduce the biochemical processes that are linked to allergies. 7. Improve exercise performance. This is due to the fruit being rich in dietary nitrates. 8. Keep you looking younger. Pomegranates contain powerful antioxidants that can delay the process of aging. Therefore, eating pomegranates can help keep your skin glowing and radiant for a long time. 9. Lowers stress levels. Apart from reducing the body’s internal oxidative stress, pomegranates also help lower psychological stress that you go through your personal and professional life. 10. Prevent plaque formation. If you would like an alternative to alcohol containing mouth wash pomegranate juice is actually a better option. Pomegranate contain certain compounds which exhibit strong anti-plaque effects. 1. Cut off the crown (you’ll see it) and discard. 2. Score and slice the rind all around, but don’t cut the rind all the way through. 3. Soak the pomegranate face down in cold water for about ten minutes. 4. Break apart the scored rinds, and remove the seeds from the flesh (the seeds will sink to the bottom of your bowl). 5. Remove the rind and membrane from the bowl with a spoon. 6. Drain the seeds with a colander and pat dry with a paper towel. To get the most out of an organic pomegranate, eat the seeds while they’re at their freshest and juiciest. This is when their therapeutic powers are at their peak! Do you eat pomegranates? What is your favorite way to eat or drink them? I had no idea there were so many benefits! I need to eat more pomegranates. I need to use them more in my smoothies. My teen loves eating these and will take them as a snack in school. I need to stack up on pomegranate I am severely lacking in vitamins at the moment. Oh I never knew this. Thanks for sharing. I lack vitamins and minerals and this looks like something I may enjoy testing out. I have Pomegranate martini mix. Does that count? We in the Caribbean and other places where they grow natually have been eating pomegranate as children without considering all that is now all popular. Just grateful that our native food is finally recognised. I love pomegranate. It definitely has a lot of benefits, and it's a good anti-oxidant. Thanks for sharing more information about it! Pomegranates is really healthy that's why my husband and I were loves it. Thank you for sharing the health benefits. Wow! I love promegrenade juice. I didnt know this fruit has this much benefit. Thanks for sharing this. I'm going to the store this evening, so I feel like I need to pick some of these up now! Thanks for the tips on how to cut them too. 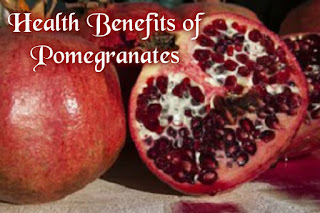 I've never heard pomegranates before, but its interesting because of its health benefits. I have heard so much about this super fruits. They are just too hard to find where I live. wow, I didn't know some of these benefits. We love pomegranate juice too! I did not know there were so many fantastic health benefits to eating Pomegranates. I will have to start buying them more often. I love pomegranate for this exact reason! So yummy and healthy!!! I love pomegranates but hate the fuss that goes into preparing them. Since I spotted ready to eat pomegranate seeds in the chilled counter of the local supermarket I have started to eat a lot more of them.